As children, my siblings and I often proudly pranced around singing the chorus of A Frog He Would a Wooing Go. What a feather in our cap it was to know that our name was famous enough to be featured in a traditional nursery rhyme. Rowley was my father’s name. Its origins date back to a small parish in the East Riding of Yorkshire in England. Before I started this blog I contacted the Rowley Parish Council in Yorkshire. They confirmed that the first syllable in Rowley rhymes with ‘bowl’ so that Rowley rhymes with ‘holy’ and ‘moly’ as in the song above. The catalyst for writing this rant about pronunciation was the straw that broke the camel’s back: something that happened to one of my nieces. I’ll tell you about that in a minute. Growing up in the small country town of Orbost, no-one ever mispronounced Rowley. So it came as a bit of a shock when, having ventured further afield to the big city, I first heard my surname pronounced so that the first syllable rhymed with ‘fowl’. I excused that person on the assumption that their education was lacking. However, when I heard it mispronounced a second time and then a third time, I started to get annoyed. It seemed to me that Rowley was incredibly easy to pronounce. How on earth could people get it so foully wrong? This vexed issue was one of the reasons I chose the pen name Brigid George for the murder mystery series I have started writing; JB Rowley seemed too hard for many people. I’m waiting for the day when I’m invited up to the podium to accept my prize for best mystery novel at the Edgar Allan Poe Awards. 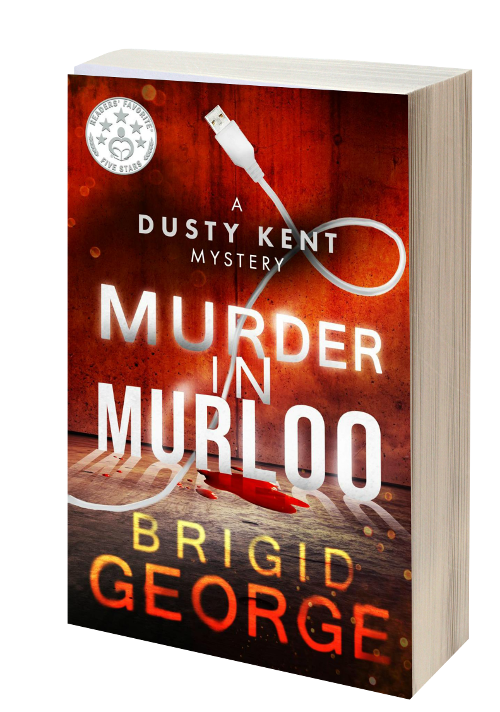 Will they be able to pronounce Brigid George correctly? For someone who has several names (June Barnes-Rowley, JB Rowley, Brigid George being the main ones) it might seem strange that I get my kickers in a knot about the mispronunciation of my family name. But I do. I recall an instance when an English teacher in a secondary school mispronounced Rowley when she introduced me to her class as a guest speaker. When I corrected her, she objected saying ‘row’ rhymes with ‘cow’. To enlighten her, I wrote the word ‘bowl’ on her board. I could also have written: bowler, bowling, knowledge, etc. And I could have lectured her on different pronunciations of ‘ow’ such as in crow. However, since by this time she seemed willing to accept that I knew how to pronounce my own name, I didn’t. Over the years, I resigned myself to the fact that on some occasions I will hear my name mispronounced and I should grit my teeth and remind myself that the Rowley motto is ‘bear and forbear’. HOWEVER, I knew I had to take action when one of my nieces recently told me that she had been informed by teachers at school that she was not pronouncing her name correctly. Her own name! For now, I’ll put aside the arrogance of those teachers and the damage they might have done to a young child’s confidence. There is something even more dangerous afoot. Clearly, there is a conspiracy out there to brainwash all the Rowleys into mispronouncing their name! I knew I had to arm myself with my trusty pen and put a stop to this mischief. So here I am to set the record straight. All Rowleys will now have a reference to refer to and none of us need ever again be thrown into a state of discombobulation by non-Rowleys who think they know better. I should point out that the Rowley coat of arms bears the wolf, so if you do mispronounce our name, beware of wolves!